None of us expects what is about to happen. A small group of us are just beginning our latest hour-long online exploration of personal learning networks (PLNs), with Twitter as our means of communication. For those on the west coast of the United States, it’s the Thursday morning version of the Wednesday night session scheduled during this third of five weeks in the Exploring Personal Learning Networks (#xplrpln) course that Jeff Merrell and Kimberly Scott are currently facilitating under the auspices of the Northwestern University Master’s in Learning & Organizational Change Program. A few of us know each other from the time we spent online together earlier this year in #etmooc, the Educational Technology & Media massive open online course (MOOC) developed by Alec Couros and colleagues. A few more of us have become part of each other’s personal learning networks through our collaborations in this new personal learning network MOOC. Coline, having stumbled (virtually) into the chat by seeing my comments in her own Twitter feed, steps up to the plate by asking what topic we’re pursuing. Jeff further draws her in—I’m no longer her sole conduit to the chat and to the group—and he provides an in-the-moment example of a connected educator in action by offering a response that includes a link to the page with information about our Week 3 goals and objectives, readings, and activities. At which point we have seen another example of exactly what we are studying: in less than 15 minutes, a piece of my personal learning network has collided with those of other course participants, and the two begin to seamlessly merge to the benefit of everyone involved. And even though Coline is not able to continue on with the discussion for the entire session—she inadvertently omits the tweet chat hashtag that would make her comments visible to the rest of us—the introductions have been made; the players have the seeds for new growth in our personal learning networks; and we all have a visceral understanding of how PLNs work by evolving naturally, serendipitously as well as through our intentional actions, as all of us engage in our roles as connected educators, connected learners, and participants in Connected Educator Month activities and celebrations. We also see and note that even though this session is primarily relying on synchronous exchanges, there are also asynchronous participants in the sense that we are drawing upon and building upon comments made by colleagues who attended the Wednesday evening session: we have access to the transcript of that earlier session, a few of us paraphrase or include quotes from the earlier session, and there’s even a brief drop in during this Thursday morning session from one of our Wednesday evening colleagues. After the session ends, we’ll continue the discussion via exchanges in our Google+ community, various tweets back and forth, and blog postings that attract responses from other members of our connected leaning community—all helping to reinforce the idea that the more we explore and the more we learn, the more we find to learn and explore. My PLN and learning experience suddenly begin moving back in time as well as forward. 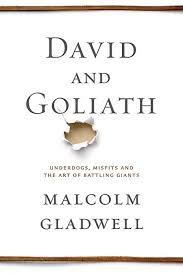 I recall a moment that occurs two days earlier: the moment in which author Malcolm Gladwell suggests during an interview with Jon Stewart on The Daily Show this week that Gladwell’s latest book, David and Goliath: Underdogs, Misfits, and the Art of Battling Giants, is the sort of book that raises more questions than it answers—and that’s OK, he adds. I think about the inevitable moments in the days and weeks to come when members of my personal learning networks continue to share resources on the question-raising questions with which we joyfully grappling. And I realize that Exploring Personal Learning Networks is very much the MOOC version of Gladwell’s latest book: we arrive with some basic assumptions; explore those assumptions while listening to other people’s assumptions; find that every potential answer takes us wonderfully deeper into the topic and, as a result raises additional questions; and we all leave with a greater appreciation for the nuances of what we are exploring, having learned experientially how wonderfully complex this and the rest of the world can be if we are not insistent on approaching learning as something to be initiated, completed, checked off a to-do list, then shelved or recalled fondly each time we look at a diploma or certificate of completion as if learning is ever finished. And doesn’t all of that just leave us with the most inspiring questions, PLNs, communities of learning, and learning experiences of all? N.B. : This is the sixth in a series of posts inspired by Connected Educator Month and participation in #xplrlrn (the Exploring Personal Learning Networks massive open online course). This entry was posted on Friday, October 25th, 2013 at 7:28 pm and is filed under personal learning networks mooc, Uncategorized. You can follow any responses to this entry through the RSS 2.0 feed. You can leave a response, or trackback from your own site. Really liked your post Paul! I think it’s an excellent description of how we’re building on each other’s thinking in this learning experience. Perhaps the only thing you left out is the internal confusion, chaos and cognitive dissonance that occurs as we joyfully grapple with the complexities ; ). It can be quite overwhelming at times, but I’m also loving it – there’s an amazing energy and engagement that exists within the group, and no shortage of thoughts, blog posts, comments or tweets to discover. Learning to let go of the feeling that you’re constantly catching up and accepting that you’ll never be able to read and reflect fully everything that is created is the key to not being totally overwhelmed by it all. How learning occurs in these open online experiences is something that really interests and intrigues me, and something I’m also interested in documenting too. Thanks for sharing! Deeply appreciative for the comment, Tanya…and yes, there is quite a bit of internal confusion, chaos, and cognitive dissonance in the complexities we face in these situations–a simple example is what we experience the first time we engage in a live tweet chat, and the payoff comes once we let go a bit and become comfortable with what the new explorations provide. Hi Paul, I’m actually finding this confusion, chaos and cognitive dissonance quite interesting in itself! You think you’re clear on something, then…Boom! all of a sudden someone comes along with a comment, blog post, tweet or whatever that challenges (shatters) that false sense of cognitive security. But it’s fascinating to see how, in an open environment, where people are mutually engaged in the ideas, and finding a way through the fog, that noone gets defensive about maintaining their position. Generally it seems they go quiet for a while, reflecting, thinking and turning things over before coming out with a considered reflection that takes into account the other person’s point of view.